On January 12, 2007 “the most expensive building sale in U.S. history” closed: Tishman Speyer’s $1.8 billion sale of 666 Fifth Avenue to the Kushner Companies (owned by Jared Kushner, who also owns the New York Observer.) My last Noticing New York article included information about how this related to another real estate transaction that also occurred in 2007 (through sale of rights to build a bigger building) just a few doors down, the New York Public Library’s sale of the five-story Donnell library, newly renovated and in excellent condition with additional basement space to boot, for a net of $39 million. This small net to the NYPL is after taking into consideration of its plans to get back a less than one-third size underground `replacement’ library by perhaps 2015, the plans for which were thoroughly discussed in that article. The basement library space will be at the bottom of the 50-story luxury hotel and condominium building going up at the site of the former Donnell. See: Friday, May 24, 2013, Previews Of The Proposed New Donnell Library: The NYPL Unveils Its Version Of The “Silk Purse” Libraries It Envisions For Our Future. Since there was newly turned up information in that last article I wrote I thought it would be worthwhile to come back and reconsider the amount that the NYPL sold Donnell for, in light of that information. How good or bad a deal did the NYPL structure for the public? Based On Other 2007 Transaction For Nearby Property Did NYPL Get Less Than One-Third Of What Donnell Was Worth To The Public? First off, 666 Fifth Avenue on the same block and just down the street from Donnell according to the Real Deal was 1.45 million square feet so its purchase price of $1.8 billion comes out to $1,241.38 per square foot. If the recently renovated Donnell was a valuable asset and worth keeping for the public (as I and many others believe it was), then by the measure of $1,241.38 per square foot for real estate in that area the 97,000 square foot, Donnell might have been worth $120,413,793 to the public, more than three times the $39,000,000 that was netted for the library system when the NYPL sold it. But maybe that isn’t fair: The $1.8 billion that was paid for 666 Fifth Avenue was reported to be too high a price, the result of “reckless underwriting” according to the New York Times. The office rents didn’t fully support the value paid (rents covering only 0.65 percent of the debt service on the loan that was put together by Barclays). So perhaps the estimated value of the public keeping Donnell if done through the kind of calculation above should be adjusted downward a bit. A bit maybe, but in the relative scheme of things not by all that much: Read on. Did somebody know when 666 was bought that there was other potential value in the building? We will momentarily get to what the sale of rights to the new Donnell site owners brought in to the 666 Fifth owners. 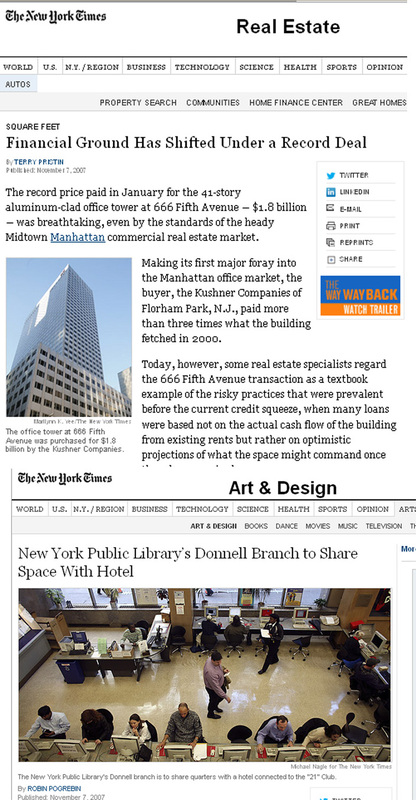 In coincidence that stands out as strangely interesting the New York Times ran an article describing what a very bad deal the purchase of 666 Fifth Avenue was on November 7, 2007, the very same day that the Times first reported the surprising news that the Donnell had been sold. At the time, nobody (at least nobody on the outside) knew that the two deals would wind up being related when the 666 Fifth owners would sell the owners of the new Donnell site the right to build taller at that site. • Financial Ground Has Shifted Under a Record Deal, by Terry Pristin, November 7, 2007. Foreseeable Future: Doom and Gloom? Many people in real estate worry that the subprime mortgage debacle could lead to sizable layoffs in the financial services industry, emptying a lot of office space in Manhattan and causing rents to fall. But Mr. Konsker said a number of tenants outside that industry are currently looking for space. And so far, although the pace of leasing has slowed, there is no evidence that asking rents have declined. Of course none of us could foresee that the economy would change and change the schedule of this. . .
. . said it had little choice because the branch, built in 1955, was in dire need of renovations that the system could ill afford. The library says Donnell is in serious need of repairs, with the oldest elevator of any branch in the system and outdated air-conditioning, heating and electrical systems. “It’s not in great shape, to say the least,” Mr. LeClerc said, adding that the library had to have pieces specially made to repair the old-fashioned air-conditioning system. The assessments above are subject to question given that there was a history of recent and substantial Donnell renovations and the reflexive habit that library officials have of conjuring up extraordinary air conditioning repair costs whenever they want to sell real estate. Profits Make 666 Fifth Avenue Purchase A Good Deal After All? Was the 666 Fifth deal realy not a good one? By January 17, 2012, Terry Pristin, the New York Times reporter who had reported November 7th 2007, on the 666 Fifth financial woes was reporting that, with a restructuring that involved the entrance of Vornado realty (Bloomberg LP’s landlord), and the sale of the additional building rights to the Donnell site, the purchase had weathered the financial crisis and was again on solid footing. See: Surviving a Big Risk on Fifth Avenue. Building ownership value was unlocked by buying out low rent leases and until the restructuring was put in place, reserves that had been set up in advance were drawn upon covering the deficient cash flow. Several months later The Real Deal ran an article (August 01, 2012) with calculations of how much everybody in the real estate industry made from 666 Fifth Avenue deal: Tallying who won at 666 Fifth Avenue- Ranking winners, losers in wake of Vornado $707 million purchase of the trophy tower's retail condo, by Adam Pincus. • Kushner Companies: Estimated profits of about $100 to $120 million on the retail side offset by a “loss” or infusion of new equity on the office rent side of more than $200 million- So that amounts to at least $80 million as an additional forced investment of capital. The Real Deal does not specifically mention whether its calculations took into account Kushner’s sale of rights to the Donnell owners to build extra floors which, according to the Times brought in at least $30 million, potentially reducing that aforementioned $80 million figure for the infusion of capital. • Carlyle Group (partnering with Crown Acquisitions): Estimated profits of $200 to $230 million on retail condominiums within the complex. • Brokers: Estimated $7.5 million in commissions on the retail side. We reached out. . . or we didn’t reach out, but our financial adviser reached out to several other parties who we thought might have specific reasons . . . so there were quite a number of developers in the development community who were contacted to see if they wanted to compete with this process and we did end up with a competitive process. The closing of the sale of Donnell was July 27, 2011 to Tribeca Associates and Starwood Capital, who bought the real estate contract from Orient-Express and closed, according to Offensend, with the NYPL’s approval. Based On Information About “Air Rights” Transactions, Was Donnell Sold For Many Millions Below Its Value? Perhaps Hundreds Of Millions Less? The Tribecca Associates’ website says that “air rights” comprised 50,000 square feet, or about 15%, of the building rights (50,000 out of 340,000 square feet). In 2011, Tribeca Associates LLC, in partnership with an institutional partner, acquired 20 West 53rd Street from the New York Public Library System, as well as approximately 50,000 square feet of air rights and a light and air easement to develop this 340,000 square foot mixed-use project. The Partnership intends to develop a landmark 120 key, 5-star hotel and approximately 130,000 square feet of luxury residential condominium units that will feature hotel amenities. With a Plaza District location directly across from the MoMA, this building will feature unrivaled access to the city’s finest shopping, dining, cultural venues and will be in the heart of the midtown office market. Are the 50,000 square feet of “air rights” the rights purchased (15% of the buildable rights) from the 666 Fifth owner? . . . . The original deal with Orient-Express was described in the Times in November 7, 2007 as a deal to build an 11-story hotel (making the low price paid to the NYPL perhaps a trifle less startling) but the building now going up is described in the Daily News as 50 stories and sometimes reported elsewhere as being 45 stories. That hardly accounts for the difference between 11 stories and 50 or 45. The 50,000 square feet of “air rights” probably includes, but is not exclusively comprised of, the rights purchased from the 666 Fifth owner. March 6, 2012 The Real Deal reported on the acquisition “air rights” by Starwood Capital and Tribeca Associates to go to 45 stories: $30.825 million for air rights from the owners of 666 Fifth Avenue (just slightly over the figure mentioned in the Times), and $16.6 million for air rights from Orient-Express from the 21 Club (probably dating back to the July 2011 closing). See: Starwood, Tribeca move forward with Midtown condo and hotel. At $47.425 million for 50,000 square feet, that would come to $948.5 per square air rights foot, that would seem to be high for the market. If the 50,000 feet is just what was bought from the 666 Fifth owner (treating the $16.6 million acquisition from Orient-Express as part of the overall land cost) per square air rights foot would price at $616.5 probably close to the market. If the 50,000 feet is what was bought from Orient-Express per square air rights foot would price at $332, which might be considered rather low for the market across from MoMA. I am reviewing these figure in order to back into the buildable rights value of the Donnell site prior to addition of the air rights. 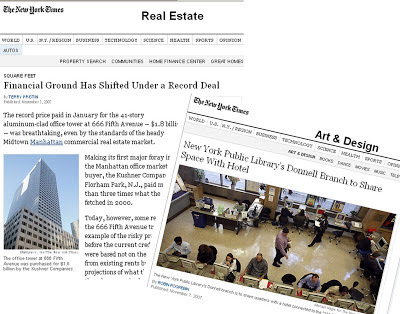 • If the very high $948.5 per square air rights foot was paid for 50,000 feet of air rights then the NYPL sold the owners the remaining balance of 290,000 buildable square feet. If those square feet are multiplied by $948.5 per square foot figure then perhaps the NYPL should have sold Donnell for $275.07 million. • If the more probable $616.5 per square air rights foot was paid for 50,000 feet of air rights from the 666 Fifth owner, then maybe another 26,764 square feet in air rights would be attributable to the $16.6 million Orient-Express transaction, leaving the NYPL with 263,236 buildable square feet to sell, which at that price would sell for $162 million. • If the very, very low $332 per square air rights foot was paid for 50,000 feet of air rights from the Orient-Express, then maybe another 92,846 in square feet was bought from the 666 Fifth owner leaving the NYPL with 197,154 square feet to sell which, at that very low price, would have sold for $65.46 million. But, setting aside the concept of air rights to simplify this calculation, The Real Deal in October of 2007, around the time of the NYPL’s Donnell deal, was pricing real estate in Manhattan at a much higher buildable square foot price: $650 (nearby 62nd Street and CPW) $1,050 (12-story prewar 823 Park Avenue at 75th Street) $400 (from 60th Street to 86th Street, between First and Lexington Avenues). See: Developers see land prices jump, October 17, 2007,by Juliette Fairley. So even if we went down conservatively to a price of $450 per square buildable foot based on these figures that would mean that 197,154 buildable square feet should have garnered the NYPL at least $88.7193 million. Prior to the 2007 Donnell deal, the NYPL was criticized for lack of “transparency” and failing to structure a proper bid process to sell off NYPL property of special value to the New York City public. Back in 2005 this transaction was also during the tenure of COO David Offensend, who started at the NYPL in 2004. The criticism was that there was “a hasty and secretive process” suggestive of the fact that “the people in charge of the sale knew perfectly well” there something particularly unusual going on. The NYPL as seller was represented by a broker who had a conflict of interest relationship since it was also an adviser to the buyer and, in another conflict of interest, an adviser to the NYPL was both an adviser to the seller and connected with those who made the failed competing bid. No matter, the “swiftly organized” “closed bid” was clearly set up to favor the particular wealthy buyer in play. The criticism came from various quarters but the criticism quoted above and published in the New York Times came from Michael Kimmelman, who has since become the Times architectural critic and is also a strong critic of the NYPL’s Central Library Plan, essentially a convoluted real estate deal with strong similarities to the Donnell transaction in how it shortchanges the public. See: Critic's Notebook: Civic Treasure: A Need for Transparency, Not Secrecy, by Michael Kimmelman, May 18, 2005 and Critic’s Notebook- In Renderings for a Library Landmark, Stacks of Questions, by Michael Kimmelman, January 29, 2013. It's time for transparency. Increasingly, we demand it from government, the media and Wall Street, in response to dwindling public faith. The same should apply to libraries and museums, which also regularly test our trust. Public institutions must avoid even the appearance of impropriety when selling art. That's why the New York attorney general in the 70's, Louis Lefkowitz, responding to the ruckus over the Met's private sale of pictures, recommended that museums sell through open (not closed-bid) public auctions. That still makes sense. Public auctions or some other public process, obligatorily announced loudly, widely and well beforehand, plus the chance for local museums to match prices after a sale, would mean greater visibility and precious time to gain public faith. The reason Lefkowitz stepped in when he did is because the New York State Attorney General is charged with overseeing and ensuring proper conduct of the state’s charitable institutions like libraries and museums. Kimmelman’s reference to Lefkowitz may be viewed as an invitation to the Attorney General of the time to step in and investigate the sale of the Durand painting. Had that happened perhaps many further ensuing events like Donnell might also have been halted. 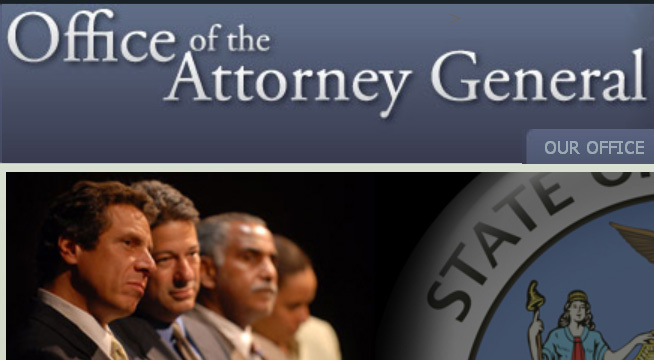 The New York State Attorney General who did not swing into action in May of 2005 was Eliot Spitzer, the “Sheriff of Wall Street,” then running for governor and now, after his early exit from the governorship, is a talking head in such documentaries as Frontline’s “The Untouchables” where by narrating to prove he knows how to investigate (“I’ve always believed that you start at the bottom up”) he helps prove that a conscious lack of investigation is currently treating big fish on Wall Street as being immune from prosecution for fraud. Although there is a fair amount of overlap between some of those involved in the Wall Street financial crisis and those involved in the real estate industry, Spitzer, form a real estate family himself, never took on New York City’s real estate industry. The New York State Attorney General who was in office when Donnell was unfolding in the fall of 2007 was Andrew Cuomo, now the Governor of New York. 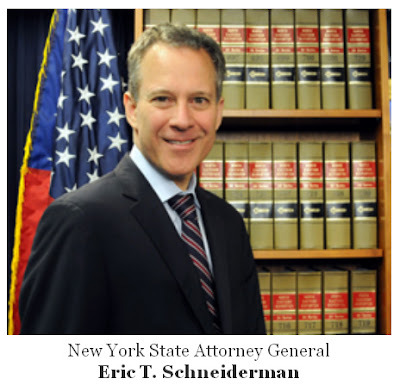 The current New York State Attorney General who could still be looking into what happened when Donnell was sold, especially as it pertains to the currently unfolding Central Library Plan real estate deals and the fact that NYPL President Marx and COO Offensend apparently view the Donnell deal as model for what is to be done with library real estate throughout the system, is Eric Schneiderman who took office January 1, 2011. The Metropolitan Transit Authority recently auctioned off development rights over the Hudson rail yards on the West Side. It accepted what was not necessarily the highest bid, saying the lower bid was in the public's interest. Even had the NYPL sold Donnell for a figure like $89 million (the conservative low figure calculated above based on buildable rights), thereby netting on the order of only $69 million after building a much smaller replacement library, the question is whether it would have been a suitable deal in terms of the assets the library system was thereby giving up with such shrinkage and retrenchment in the face of city growth. We can also look at the value of assets at that address in terms of the value on what is being built to replace the Donnell on its former site. The 7,381 square foot penthouse in the building going up there is being offered for $60 million: Cut Glass: Baccarat Wants $60 M. For Its Crystal Penthouse, by Stephen Jacob Smith, Feb 26, 2013. That’s a value of $8,129 a square foot. According to that measure the old Donnell would have been worth about $789 million to the public. It is, of course, much fairer to look at the average total asking price for the building’s 61 condominiums occupying a total of 130,000 square feet: $523 million, about $4,023 per square foot, making the Donnell’s 97,000 square feet worth about $390 million to the public. No matter which way you cut it, the NYPL’s sale of Donnell gave up a valuable, nearly irreplaceable asset belonging to the public. In its place will stand a building with 61 condominiums occupying a total of 130,000 square feet valued at $523 million and a luxury hotel with maybe 151 rooms in the remaining 210,000 square feet, which all totaled will be worth perhaps to $1.4 billion to its owners. . ..
. . . This is why New York's citizens are having such difficulty fending off the real estate industry to protect our publicly owned property.